Make your workouts feel brand new. Performing at your absolute best during every workout is almost impossible. But an essential part of building muscle is submitting your muscles to stress and stimulation. L-arginine helps you push yourself to the limit. Even during your most intense workouts. Want to feel more energetic when you exercise? L-arginine can help. The better your body can absorb amino acids, the harder you can train. That's why we use only premium L-arginine. Easily absorbed by the body. Want more energy when exercising? L-arginine will give it to you. The better your body can absorb amino acids, the better you can train. That's why we rely on premium L-arginine. No, capsules don’t have to be made of processed slaughterhouse waste. In keeping with our commitment to purely plant-based raw materials, we use vegan capsule shells. The origin? Cellulose fiber from natural, renewable raw materials. We never use human hair or duck feathers in our L-arginine. Our arginine is produced 100% from fermented corn. This means our workout booster is 100% of natural origin. For the most demanding power athletes and endurance athletes. Our L-Arginine. In a class of its own. Dietary supplements are no substitute for a balanced and varied diet and a healthy lifestyle. Do not exceed the recommended daily dose. Keep out of reach of children. May contain traces of gluten, egg, soy, and milk (incl. lactose). Take 4 capsules pre-workout with plenty of liquid. Take 4 capsules a day if you exercise more than 3 times a week. L-arginine improves the nutrient supply to the blood vessels. And we mean all the vessels. best suport for my workout. I totally like your prodcts. Ordered l-arginine and the delivery was quite fast. Another high-quality product from foodspring. Vegan and so natural. Couldn't ask for more. At first, I was a little sceptic but after contacting the friendly customer service I am excited to try this product. Super boost after workout. And for me as a vegan it´s perfect. Along with BCAA and glutamine, L-arginine is one of the best known and most popular amino acid supplements among athletes. L-arginine belongs to the semi-essential amino acids, i.e. it can be produced by the body itself, but often not in sufficient quantity for regular exercise. Why is L-arginine so important for our body? Arginine is involved in a large number of processes in the body, including the formation of nitric oxide, one of the smallest messenger substances in the body. Nitrogen is also known to be the main substance responsible for the protection and regulation of blood vessels. Particularly interesting here is the fact that nitric oxide promotes vasodilation and improves nutrient transport to the muscles. Arginine therefore helps supply the muscle cells. Due to the characteristics described above, L-arginine is primarily used before exercise for a positive impact on strength and endurance levels. Differences in quality arise in the pharmaceutical form of arginine. Inferior arginine HCL (hydrochloride) supplements are often extracted from human hair or duck feathers. By contrast, high-quality L-arginine has a much larger content of real arginine, better bioavailability and is fermented from plant sources like corn or sugar cane molasses. L-arginine is primarily used to support training performance in terms of strength and endurance levels. It is also suitable for muscle building as a "booster" for your workout. An additional intake of L-arginine in conjunction with an exercise regime supports nutrient transport - this results in a better supply to the muscles and increased performance in strength and endurance training. In the world of strength and weight training, "pumping" is often mentioned in conjunction with arginine. How does L-arginine force/promote muscle pumping in weight training? A noticeably improved supply of carbohydrates and proteins, along with improved blood circulation, makes you feel like you have more power available to you. Meaning you can lift heavier weights or complete more reps. This leaves the muscles well supplied with all the nutrients they need and means they can work effectively. Arginine is ideal for weight lifters who want to improve the nutrient supply to the muscles and support exercise performance. This can often lead to you being able to achieve more reps, lift heavier weights and manage with shorter breaks, which makes the workout more successful in terms of a progressive increase in strength. A study by an English university has shown that with additional arginine, endurance athletes could train for up to 20% longer and overall endurance improved by 1 - 2%. Blood pressure was also improved. Weight lifters should take L-arginine on an empty stomach about 30-60 minutes before exercising, in order to benefit from the full effect. L-arginine can also be taken on non-training days to support your training performance, although this is not strictly necessary. Arginine available in powder or capsule form, Both forms are well tolerated by the body and are rapidly absorbed. The biggest difference is in the taste. L-arginine has a naturally unpleasant taste, but the capsules are tasteless and easier to take in this sense. Even when combined with juice the powder retains its fishy, salty, bitter taste, making it a lot less popular than capsules. L-arginine capsules have the additional advantage that they are easy to dose and easy to carry. Taking more than 15 grams a day may cause temporary digestive problems, stomach cramps or nausea. If you follow the recommended dosage you need not worry about side effects. A large number of online retailers sell L-arginine. However, there are significant differences in quality. Before buying, you should check which nutrients and ingredients are used. Most arginine products use arginine HCL (hydrochloride) as a pharmaceutical form. The human body does not absorb arginine hydrochloride so well. The raw materials from which inferior hydrochloride is extracted, are often human hair or duck feathers. The high-quality alternative is called arginine. This has a significantly higher bioavailability in the body. Arginine is produced by fermenting raw materials like whey, corn or sugar cane molasses. 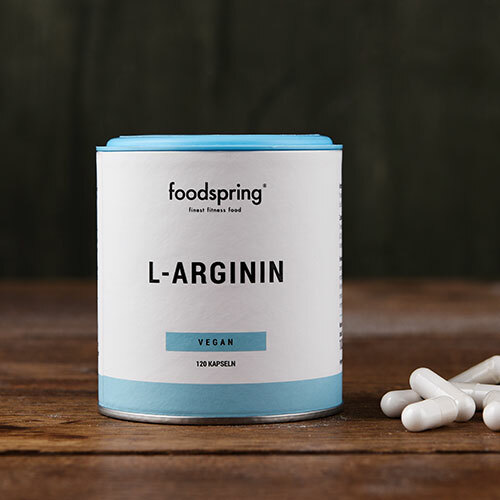 Premium L-arginine by foodspring consists of pure fermented corn. It is also 100% free of artificial flavours and both gluten- and lactose-free. And the capsules are vegan. What is the difference between arginine and hydrochloride? The raw material arginine hydrochloride is often used in low-cost products. The basic ingredient in these products is arginine that has been extracted from human hair or duck feathers. However, the premium raw material arginine is produced from the fermentation of plant materials. Why do you use natural arginine instead of synthetic arginine? Naturally fermented L-arginine from plant-based raw material does not contain any waste products, such as heavy metals, which is sometimes present in cheaper extractions of arginine hydrochloride from duck feathers and human hair. Fermented arginine also has a higher purity compared to the less expensive hydrochloride version and can be absorbed by the body without any unnecessary effort. What is the benefit of capsule shells made of cellulose? By using capsule shells made of plant fibres, we can offer an even greater natural quality for a 100% vegan product. Why does L-arginine need to be supplemented? L-arginine is a semi-essential amino acid that the body can synthesise in small quantities. But this is often not enough for athletes and higher quantities of L-arginine need to be taken in through the diet to properly support long-term training. There is no indication that taking arginine supplements on a regular basis stops the body from producing its own. Does arginine support muscle building? L-arginine primarily supports performance in strength and endurance sports. The semi-essential amino acid optimises the supply of nutrients to muscles so that athletes who supplement their L-arginine levels often say they are able to train more intensively. More intensive training leads to more effective development of muscles and faster achievement of personal goals. L-Arginine will be back in stock shortly.